The nancy pieces are made from handwrought links joined with pearls or crystals in an array of beautiful colors. A very delicate piece. One of my most favorite pieces. Seed beads and silver united. 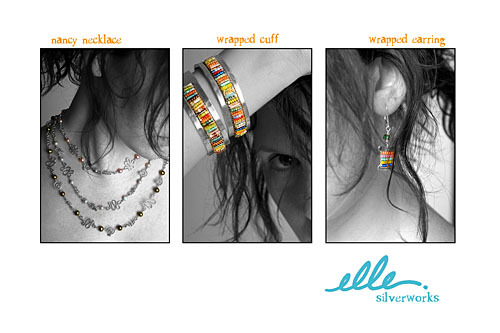 The cuff and earrings are formed from sterling silver and then wrapped with sterling silver wire and seed beads. They go with everything.